Graduation is right around the corner! If you were like me you couldn’t wait to finally be done with high school. The summer between high school and college was one of the most fun i’ve had in my life! The last time to do crazy things with high school friends, shop for your college dorms, and best of all, no homework! While this will be super fun and great, you don’t want to miss out on everything that graduation is. Graduation is a huge celebration of your awesome accomplishment. It’s a reason for family and friends to get together to celebrate YOU! What could be better than that? Its an emotional time for parents seeing their child all grown up, and this celebration is something they will put a lot of effort into and will cherish for the rest of their lives. Whether you are going to celebrate with a backyard barbecue or have a quiet desert night with close family and friends, we have everything you need to celebrate this great milestone! When I had my graduation party the best part was the photo booth! I grabbed a tablecloth in my school’s color and hung it against a wall. I bought this really fun prop kit with graduation themed props and set them on a small table. Then all my friends and family could take pictures together! We just used our smart phones and my mom’s digital camera to capture the moments! It was so much fun and now I have those pictures to look back on for years to come and my guests were able to get in on the action as well! This is an awesome photo booth prop set! 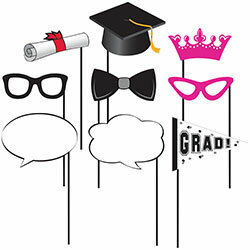 It includes 10 graduation themed props for you to capture countless memories at your graduation! Whatever you plan to do for your grad party make it memorable! 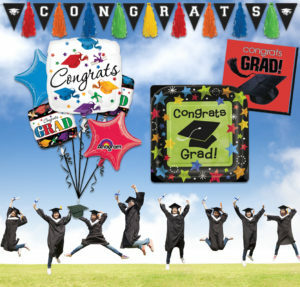 Check back for more ideas on fun ways to make your grad party great as well as to see some of our coolest grad products!